I have also seen these fun CURRENTLY posts and I'm excited to participate in my first CURRENTLY link up, brought to you by Farley. Listening: I cannot believe Grey's Anatomy is coming to an end. I am truly devastated. However, I'm SO glad that I have How to Get Away With Murder to fill my Thursday nights now. 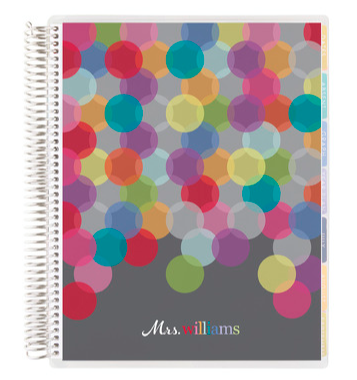 Loving: OMG I looked and looked at the Erin Condren teacher planners for ever last summer but I was too scared to pull the trigger and get one. Boys did I regret that! I finally got one for my birthday (in February) and yes, it doesn't start until June...but I was exited to start filling in some of my summer plans tonight! I ordered this adorable sequin cover. 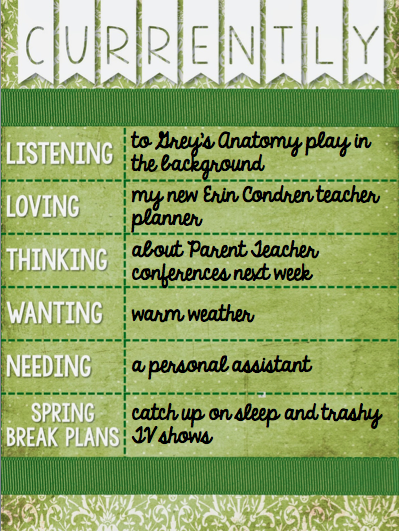 Interested in ordering your own Teacher Planner? Use my referral code here. Thinking: Parent Teacher Conferences are right around the corner and I am hosting Student-Led Conferences for the first time. What are your best tips for successful conferences where the students run the show? Wanting: Warm weather! We got slammed with a good 7 inches of snow this weekend, but no snow day! I'm all for a good snow shower if we get a snow day, but this year all of our weather has fallen over the weekend and we've been stuck at home on our days off. No fun! Spring Break Plans: None as of now. I see a lot of naps and bad TV in my future. Have to catch up on all my Real Housewives. I can't wait to read all of the other fun CURRENTLY posts. Make sure you post yours and link up too! Okay that is hilarious- I used the same font you did. I love my Erin Condren planner too and am obsessed with all the seasonal changeable covers. They are super cute! Here is hoping for warmer weather for you. Can you change out the covers for the Teacher Planners? I would love that! 1. Glad to have found your blog. I am in Charleston, IL so not too far from you! 2. I am also working on my Masters and agree - there just isn't enough time in each day! 3. I am embarrassed to say that I had NO idea Grey's was coming to an end :( Luckily I am almost equally obsessed with How to Get Away with Murder. Have a great week and good luck with those conferences! That's so nice that you have 30 minutes with each parent. We're limited to 15! I'm wondering how I'm supposed to fit it all in. I barely made it in the fall when it was just me talking, now it's me and the students! I would totally love to do a Powerpoint! What a neat way to bring technology into it. I would love to see one of your student powerpoints, maybe I could give it a try next year. I think I now need some Erin Conderen! We weren't hit hard with snow where I live, but I can't wait for spring!